- there were full tables and most were about one school or area. There was a Coe table, a Beacon Hill table (with some hard facts about the changes for that area), a TT Minor table, Montlake, etc. - I found these to be people who knew their facts and, if they didn't, wanted to find out more. One man pushed back against the format, asking why staff couldn't explain who thought up the boundaries and explain them. He was told they just wanted "comments and feedback." I don't think many were satisfied with that answer. -Rep Jamie Pedersen was there and he spoke as a father of four (one in school). I think he's getting a good picture of the issues. - this region HAS had a lot of push-pull from the district. I honestly had not realized how bad it has been. And, like other regions, the boundaries are NOT taking into account established "community boundaries or geographical features. For example, one area of Montlake would change and kids would now go to Stevens but up a huge hill by a ravine. - Most want TT Minor to be an elementary school. They believe the numbers are there to support this. They have respect and understanding for World School (scheduled to move in there after renovation) but feel World School is the wrong choice. This is a very tough one for me because I have fought for World School which has gotten kicked around repeatedly. But I would HATE to see them move in and then, a couple of years later, get moved out because...they need a neighborhood school. I believe the district needs to offer them the best space possible even if it is not centrally located. Either lease some Central space or move Van Asselt out of AAA and make that building the World School. It's a newish building and would be easier to create a 6-12 space there. Then, redo old Van Asselt for the current Van Asselt students. The research done on Beacon Hill and the impacts of the boundary changes on low-income students. Seattle Public Schools is pushing students at seven Title 1 schools out of their official city-approved walk zones to their nearby neighborhood grade schools and onto buses to faraway schools. Yet another layer of inequity is that this will increase the use of diesel buses in areas already disproportionately plagued by diesel exhaust and other pollution (as near I-5 and Boeing Field on Mid Beacon Hill). Including the entire Beacon Hill area, 4 out of our 6 neighborhood schools (67%) are losing walk zones, compared to 10% for the rest of the city. 100% (2 out of 2) of Beacon Hill's freeway onramp feeder arterials serve as natural boundaries between neighborhood grade school zones. The district now wants our grade school zones to overlap the freeway on-ramp arterials of Spokane and Graham. Little kids walking on-ramp arterials to get to school? Just no. Finally here's one because I was getting worried. This event, Oct-Voter-Fest has several debates. It's this Sunday, October 6th at the Columbia City Ark Lodge Cinemas, 4816 Rainier Avenue S. from 2 pm to 6 pm. It is sponsored by the Rainier Chamber of Commerce and First Thursday Seattle. As we grapple with the minutia of boundaries and enrollment, here's some higher level thinking on education to challenge you. Reform, however, has more to do with the learning experience itself. What should we be teaching? How do we think about accountability? How do we balance standards with the complexities of population diversity? Undoubtedly, technology is typically an offshoot of this dialogue, a tool through which much of this reform can be delivered and administered. But they are not the same thing. Reform is a big fancy buzzword that floats around one particular concept: what are we trying to get out of this educational experience, and how do we adjust the current system to reflect these changes? In your opinion, what is the current goal of the American Public Education System? What should be the goal of the American Public Education System? The FACMAC made a response to the Growth Boundaries plan. You can read the summary of the response here. Include high schools now. They take the longest to address, there isn't that much time, and the system is integrated. Instead of messing with nearly all of the elementary school attendance areas and middle school assignments, leave most of them essentially unchanged and put all of north-end 1-8 APP at Wilson-Pacific. Put APP there and you can leave almost everyone else alone. Adjust elementary attendance areas only as needed. Re-assign the elementary school - middle school feeders only as needed to add a middle school and adjust for the removal of APP from Hamilton. Rethink some of the BEX IV investments to more closely reflect what we will need and when we will need it. School Board Meeting from 4:15 pm to 8:00 pm. Agenda. It's quite a light agenda and this should be a fairly short meeting. One item of note is acceptance of work performed for Montlake and Thornton Creek. It's of interest because of the number of times the district performs upgrades to old buildings like Montlake and, if you totaled all the money put into these buildings over the years, it would have been simpler and better to just rebuild. As well, they are to Into the ed specifications for JA K-8. This helps to gain about $1.4M in state funding for this effort. There are no Director Community meetings this Saturday. Almost a year ago I did a thread on South Shore and compared it to the other K-8s. I found in reading, SS is about the same as most K-8s but the math is worse. So I did a comparison today with South Shore, Roxhill and Maple from 2009 to today and there seems to be two issues. One, something seems amiss from 3rd to 4th grade at South Shore. The children in third grade do really well only to see those scores drop (and I mean drop) by 4th and into 5th. Two, there is a bit of a mystery about South Shore. No one mentions the long-time partnership that started South Shore (with the New School Foundation and now LEV). Not at their school website and barely in the district's own pages. You'd think this would be some shining example of (1) what you can do with smaller class sizes and (2) public/private partnerships. Why doesn't the district talk about SS more when confronting legislators over funding? I note the district did honor South Shore this past Feb at a Board meeting and Director Martin-Morris held them up as role models to other parts of the country. I'm sure most children have no idea what is happening in Congress but I expect that they will feel the ramifications - short and long-term - in their lives. And who gets hit the hardest if the government shuts down? You better believe it's those who need the most help. A protracted delay in Department obligations and payments beyond one week would severely curtail the cash flow to school districts, colleges and universities, and vocational rehabilitation agencies that depend on the Department’s funds to support their services. For example, many school districts receive more than 20 percent of their funds from Department-funded programs. Here's a helpful chart (show it to the kids) from the NY Times on how this could all play out in the next 48 hours. An interesting op-ed at CNN by local writer/thinker, Eric Lui, on the rise of cities because of more decisive mayoral leadership (whether good or bad) and the failure of Congress to do - their - jobs. One reason is that we've all become inured to the utter dysfunction of Washington. But another is that Washington matters less every day. Even though the shenanigans of congressional Republicans make for a perfect negative civics lesson -- Don't do this in real life, kids -- in cities all across the country civic innovation is flowering, and everyday citizens are becoming newly empowered. While our federal government has tied itself in partisan knots, cities are showing the way forward. The localism of our time -- and you see it in how people eat, work, move, buy, sell, grow, share, create -- is a networked localism. The challenge of this era is to enable every citizen to think more like a mayor -- pragmatically, oriented toward solutions, willing to experiment, eager and be shameless about borrowing great ideas from other people in other places. Thinking like this is one reason I'm an activist. We live in a city where citizens matter (not always and not always on the big things) but you can be heard. And all this over wanting healthcare for all Americans (again, whether you like Obamacare or not, it is the law, it is a first effort and everyone should have health coverage). Since it's the last episode of Breaking Bad, a one-minute Canadian version. It's very funny. 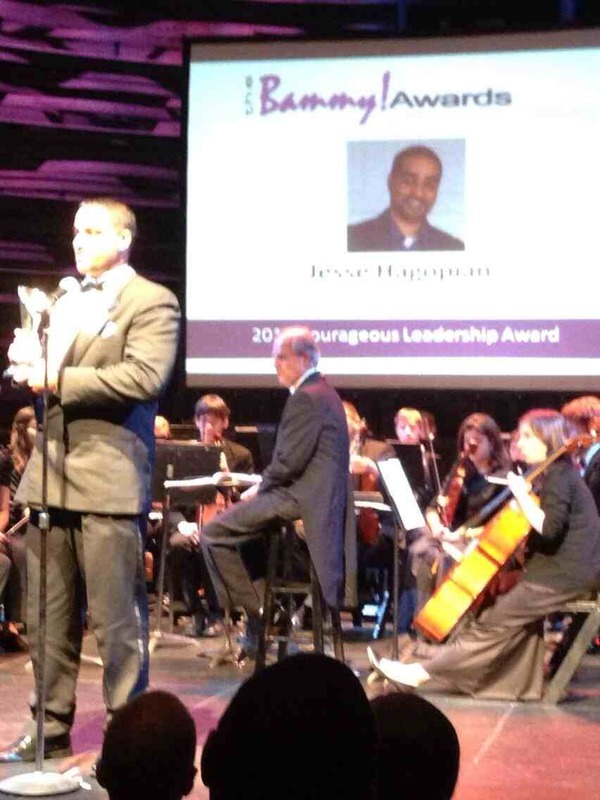 Garfield teacher and MAP boycott leader Jesse Hagopian was named the "Secondary School Teacher of the Year" last Saturday by the Academy of Education Arts and Sciences International in Washington, D.C. His "Bammy" award was also joined by a "Grammys for Teachers", a special achievement award, for his work. The annual Bammy awards recognize educators from across the education field: teachers, principals, librarians, nurses, school-board members, superintendents, and others. Hagopian’s attendance at the gala was a coincidental accident of scheduling. The National Education Association had flown him to the capital that same week to testify before the Congressional Black Caucus of the U.S. Congress. He was one of several educators from across the country that testified to the caucus about the negative impacts of standardized testing and school closures on at-risk students and their communities. The Bammys are presented by The Academy of Education Arts and Sciences International, which includes leading educators, education professors, journalists, editors, researchers, commentators, advocates, activists, visionaries and pioneers. The Academy is comprised of a board of governors, a council of peers, and associate members. I also note that Diane Ravitch singled out Garfield High School during her talk on Thursday for their tremendous effort and courage. Jesse was in the crowd, with his wife and children, to hear her praise. Readers keep asking about information and I'll try to put up as much as I can find. Questions and answers from Community Meetings will be added to the Frequently Asked Questions (FAQ) page as quickly as possible. See the complete planning Timeline. And I know some readers have asked for the very latest capacity numbers for each building. Frankly, I searched in several ways and could not find easily find them. If the district makes it this hard to find, I'm thinking they don't want you to see them. If someone has a link, great. Community Meeting with Director Martin-Morris at Diva Espresso on Lake City Way from 9:30-11:30 am. Community Meeting with Director Patu at Caffe Vita, 5028 Wilson Avenue S. from 10 am to noon. From Central District News, a story about unhappy Central area parents and elementary school choices. What's interesting is either no one checked in with the district on the use for TT Minor or chose to ignore what the district is planning (to reopen TT Minor for World School). I think there are valid points here, though. Parents and residents in a northern swatch of the Central District, from Madison Avenue to Cherry Street and from 14th to 23rd Avenues (called Areas 42 and 43) are hoping to influence the school district to reopen TT Minor as the area’s elementary school. The group’s impetus for forming is a recent projection that Stevens Elementary School will surpass its current capacity for students in the next several years. As a result, Seattle Public Schools has proposed boundary changes that will reassign students near Stevens’ southern boundary to either Madrona K-8 or Lowell Elementary. The group would prefer the district reopen TT Minor. The school district is fielding feedback on its proposed boundary changes at several upcoming meetings, including one on Monday at Meany Middle School from 6:30 to 8:00 p.m. The neighborhood group will be present at the Monday meeting to express their thoughts on TT Minor. New SPS assignments announced today by Superintendent Banda. First, Jon Halfaker, principal at Washington Middle School, is to be the new Executive Director of Schools for the NW region. This is really kind of sad because I think Mr. Halfaker is quiet, effective principal and I think it's a loss for Washington. Also, Patricia Guenther has been appointed as interim principal at Washington; she is currently assistant principal there. Both appointments start October 1. Ever wonder about the voice of the "robocall lady?" She's a real person. The story from Parent Map. To understand: coming up fast is the possibility of very overcrowded high schools. Not 5, 10 years out but probably three years. But a three-year plan may be all that is possible at this point especially since the needs/growth is very different for each region of the district. And guess what? Nearly out of inventory. Where will everyone go? Will the district go to shifts (and they have done this in the past)? Portables? get this out to the Seattle legislators. We need help. get high school on the table now. High schools are high stakes for students and parents. fix the worst of the BEX mistakes. There were many but all of the stuff they added at the last second is just flawed. The SPS staff has done Herculean work while also creating clarity about the potential size of the gap. I am surprised that they managed to make any reasonable boundaries based on how substantial the shortfall actually is.